It’s the last day of National Public Health Week! How can we promote public health year-round? By remaining committed to the right to health for everyone. WellShare is committed to ensuring that all people, no matter their race, gender, income or geographic region, have the opportunity to live a long and healthy life. 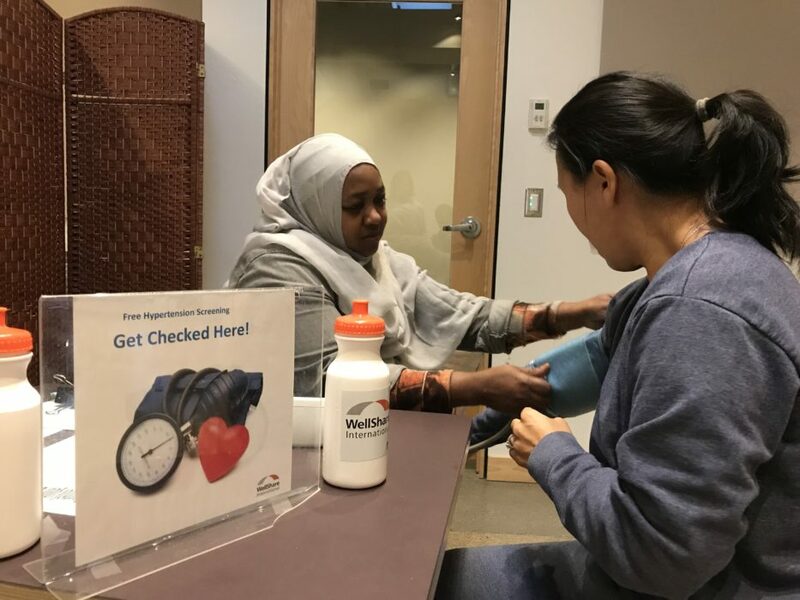 Fatima Community Health Worker at WellShare, offering free blood pressure testing. population groups and regions in Minnesota. Many people of color and specific ethnic groups such as immigrants and refugees, are less likely to receive preventive health care services and are more likely to suffer from chronic and infectious disease, illness and premature death. According to the Minnesota State Demographic Center, populations of color are expected to continue to increase to 25 percent of the total state population by 2035, making the current challenge of addressing health disparities even more important over time. Ensuring the right to health would have enormous economic and social value as health disparities are associated with substantial annual economic losses nationally, due to direct and indirect medical costs. WellShare International has worked with underserved communities who suffer from the largest health disparities for almost 40 years. Through both classes and one-on-one work, we strive to reduce the risk factors for diabetes, heart disease, and stroke in the Somali and Karen communities. We coach people on how to increase daily physical activity and the consumption of healthy food to manage or prevent chronic diseases. In addition, we’ve developed a range of health education materials in Somali and Karen. These resources provide culturally-appropriate information on reproductive health and the hazards of tobacco so that people have the information they want and need in a format they can understand. For more information on these and other programs visit our programs page.